Do you guys like peas? I'm not a huge fan of vegetables, so my favorites have always been those starchy ones people say aren't even that good for you—corn, potatoes. But when it comes to green vegetables, peas made the cut, until last year. In England last spring, Brian and I had the best fish and chips of our lives at a little restaurant in my old neighborhood, and it was served with mashed peas. I thought they were awful. Turns out it's a tradition, but I wasn't a fan, and I got turned off from peas. But last week, struggling to find something to make for a potluck, I came across this recipe and decided to give peas a second chance. And just like that, peas and I are friends again. This hummus has that traditional tahini taste, but it's also a bit spicy and so fresh! I'm glad the other guests couldn't get enough of it, either. It's also a great sandwich spread. And you can make it in less than five minutes (for less than $5!). And the food processor does all the work. All the requirements for a great recipe. Nice job, peas! Add peas to a small pot with salted water. Bring water to a boil and cook peas until tender, about two minutes. Drain and run under cold water for the peas to cool. 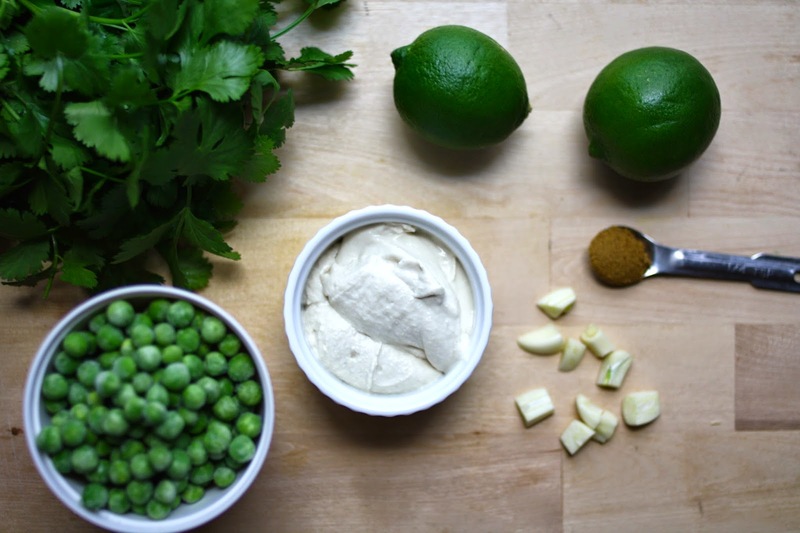 In a food processor, pulse cooled peas, cilantro, tahini, lime juice, garlic and cumin for 40 seconds. Season with salt. Serve on top of crackers, as a dip for fresh vegetables or as sandwich spread. Keeps in a well-sealed container for up to a week in the fridge.